Your doctor says you have a mid-shaft humerus fracture. What does that mean and what is going to happen next? The humerus is the bone that connects the shoulder to the elbow. This segment of the body is called the arm, and together with the hand and the forearm, makes up the upper extremity. The humerus is a strong bone that is capped with the ball of the ball-and-socket shoulder joint on the top and has a hinge of the elbow joint on the bottom. Fractures of the humerus are divided into three types: proximal humerus fractures of the shoulder, mid-shaft humerus fractures, and distal humerus fractures of the elbow. A mid-shaft humerus fracture typically does not involve the shoulder or elbow joints. This type of fracture represents about 3% of all broken bones. The most common cause of a humeral shaft fracture is a fall, but high-energy injuries (motor vehicle collisions, sports injuries) and penetrating trauma (gunshot wounds) also can cause this injury. Many humeral shaft fractures occur as a result of the weakening of the bone from osteoporosis. 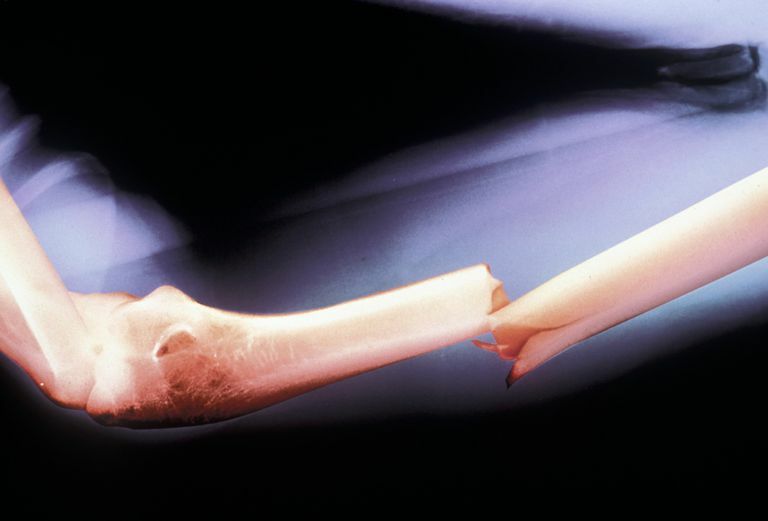 Fractures of the humerus can be scary injuries, and the X-rays often look frightening to patients. Because there is only one bone connecting the shoulder to the elbow, patients often feel as though their arm is not attached. Patients should be reassured, that there is much more than bone holding on to the arm and that the vast majority of mid-shaft humerus fractures heal without surgery. There are several treatment options for these fractures, but the most common are non-surgical treatments. Fortunately, gravity works wonders to align the humerus, and simply allowing the arm to hang by the side is often the best treatment for a humerus fracture. Furthermore, any surgical treatment has significant risks. Minimizing the chance of complication is one reason to consider non-surgical treatment. Reasons to consider surgical treatment include multiple fractures, open fractures, injuries to blood vessels or nerves, and failure of healing with nonsurgical treatment (nonunion). Fracture Bracing: The most common treatment for a humeral shaft fracture is called a fracture brace, often referred to as a Sarmiento brace, named after the physician who popularized this treatment method. Usually, the fracture treated in a splint or sling for a week to allow swelling to subside, and then a fracture brace is fitted to the patient. The brace looks like a clamshell and holds the humerus in alignment. An advantage of the fracture brace is that as healing progresses, patients can begin to use their shoulder and elbow. Metal Plates: The most common surgery for treatment of a humerus fracture is to place a large metal plate along the humerus, and secure it with screws. Use of a plate and screws is the most successful way to surgically heal a humeral shaft fracture. The concern of surgery is that risks of nerve injury and nonunion are higher with surgical treatments than with non-surgical treatments. Rods: An intramedullary rod is a metal rod that is placed down the hollow center of the bone. The advantage of the metal rod is the surgery is less invasive, and the surgeon is staying away from the important nerves that travel down the arm. The concern with a rod is that healing rates are not as high, and nonunion is a common complication. Healing of a mid-shaft humerus fracture takes several months but often exercises to improve the mobility of the shoulder and elbow joints are initiated much sooner. The two complications often seen are injuries to the radial nerve and nonunion of the fracture. Injuries to the radial nerve occur because this important nerve tightly wraps around the middle of the humerus. The radial nerve can be injured at the time of the fracture or during treatment of the fracture. Radial nerve injuries cause numbness on the back of the hand, and difficulty straightening (extending) the wrist and fingers. Most radial nerve injuries will improve with time, but your doctor will follow this carefully to determine if any further treatment is needed. Carroll EA, et al. "Management of Humeral Shaft Fractures" J Am Acad Orthop Surg July 2012 vol. 20 no. 7 423-433.